268 pages | 15 B/W Illus. Since 2003, Hong Kong has witnessed a series of large-scale protests which have constituted the core of a reinvigorated pro-democracy movement. What drove tens of thousands of citizens to the street on a yearly basis to protest? What were the social and organizational bases of the protest movement? How did media and public discourses affect the protests’ formation and mobilization? How did the protesters understand their own actions and the political environment? This book tackles such questions by using a wide range of methods, including population and protest onsite surveys, media content analysis, and in-depth interviews with activists, politicians, and protest participants. It provides an account of the "self-mobilization processes" behind the historic July 1, 2003 protest, and how the protest kick-started new political dynamics and discursive contestations in the public arena which not only turned a single protest into a series of collective actions constituting a movement, but also continually shaped the movement’s characteristics and influence. 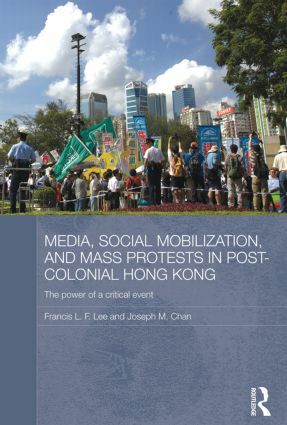 The book is highly pertinent to readers interested in political development in Hong Kong, and as a case study on "the power of critical events," the book also has broad implications on the study of both media politics and social movements in general. "Lee and Chan's book represents the most serious and comprehensive scholarly effort to analyze the July 1, 2003 mass protest and its implications to date. It is a masterpiece that integrates traditional qualitative methods, like media discourse analysis, elite and focus group interviewing, with rigorous quantitative analysis." - Olivia Cheung (St. Anthony's College, University Of Oxford); St Antony's International Review 2013. Francis L. F. Lee is Associate Professor at the School of Journalism and Communication, Chinese University of Hong Kong. Joseph M. Chan is Professor of Journalism and Communication at the Chinese University of Hong Kong. He also served as the Changjiang Chair Professor of Journalism at Fudan University, Shanghai. The authors also co-edited Media and Politics in Post-handover Hong Kong (also published by Routledge, 2008).